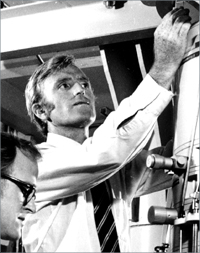 Gareth Thomas was Professor of Metallurgy at University of California, Berkeley (1966-2006). Other institutional affiliations include the Lawrence Berkeley National Laboratory and Cambridge University. His research interests included microstructural design of advanced materials, metallurgy (steels), ceramics (for high temperatures), magnetic materials (hard, soft, recording), and advanced electron microscopy and applications in MSE. August 9, 1932Birth, Maesteg (Wales). 1952Obtained BSc, University of Wales, Cardiff (Wales). 1955Obtained PhD in Metallurgy, Cambridge University, Cambridge (England). 1956 – 1959Imperial Chemical Industries Fellow in Metallurgy, Cambridge University, Cambridge (England). 1959Visiting Scientist, Alcoa Research Laboratories, Alcoa, Inc.
1960 – 2014Assistant Professor to Associate Professor (1960-1966); Professor of Metallurgy (1966-2006); Associate Dean, Graduate Studies (1968-1969); Assistant to the Chancellor (1969-1972); Acting Vice Chancellor, Academic Affairs (1971-1972); Chair, Faculty of the College of Engineering (1977-1978); and Emeritus Professor of Materials Science and Engineering (2006-2014), University of California, Berkeley, Berkeley (Calif.). 1971 – 1972Guggenheim Fellow, Cambridge University, Cambridge (England). 1972 – 1973Visiting Professor, University of Chile. 1975President, Electron Microscopy Society of America. 1981 – 1993Science Director, National Center for Electron Microscopy, Lawrence Berkeley National Laboratory, Berkeley (Calif.). 1983Member, National Academy of Sciences. 1984Member, National Academy of Engineers. 1986 – 1995Secretary General (1986-1990); President (1986-1990); and Vice President (1991-1995), International Federation of Societies for Electron Microscopy. 1995 – 1998Editor-in-Chief, Acta Materialia and Scripta Materialia. February 6, 2014Death, Oegstgeest (Netherlands). Science Director, National Center for Electron Microscopy. Associate Dean, Graduate Studies; Assistant to the Chancellor; Acting Vice Chancellor, Academic Affairs; and Chair, Faculty of the College of Engineering. Assistant Professor to Associate Professor; Professor of Metallurgy; and Emeritus Professor of Materials Science and Engineering. Editor-in-Chief, Acta Materialia and Scripta Materialia. Secretary General; President; and Vice President. Obtained PhD in Metallurgy (1955). Imperial Chemical Industries Fellow in Metallurgy and Guggenheim Fellow.